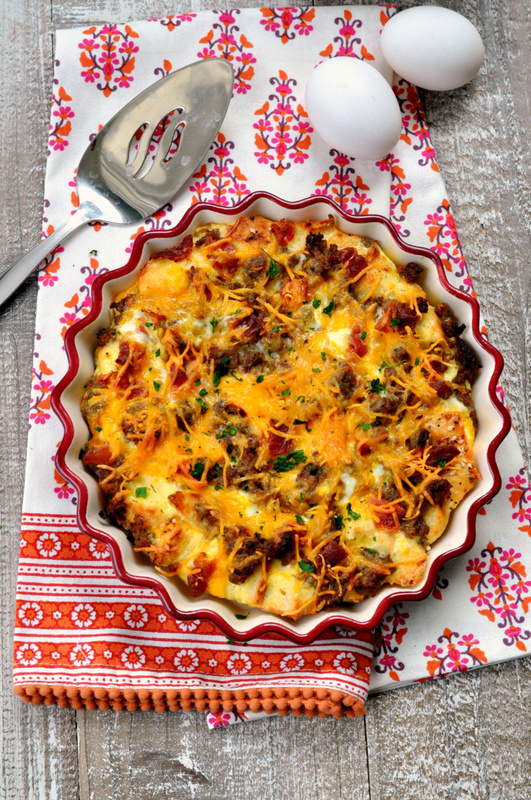 A meat lover’s breakfast casserole is the perfect way to make breakfast simple and easy but also full of delicious flavors! This one can easily be assembled at night and baked in the morning. With Father’s Day coming up fast, we are definitely starting to make plans for how to celebrate. 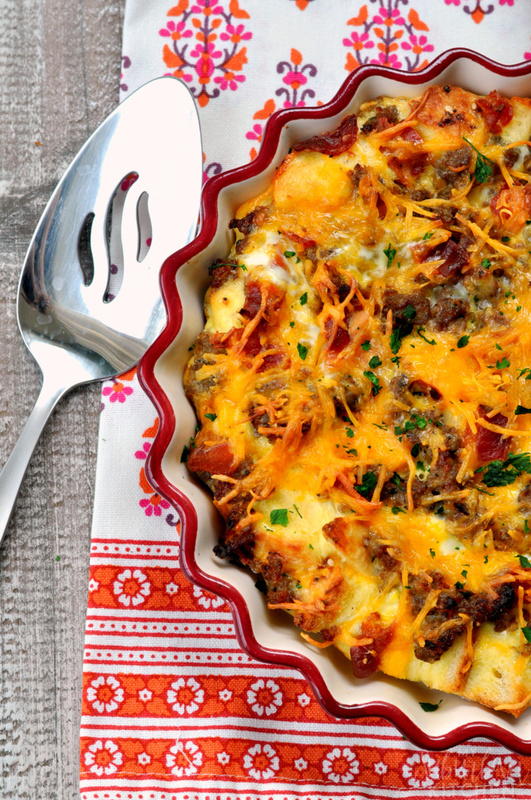 I know for sure this meat lover’s breakfast casserole is on the list because what dad doesn’t like a yummy breakfast prepared for him that also features “all the meats” as my 10 year old would say. 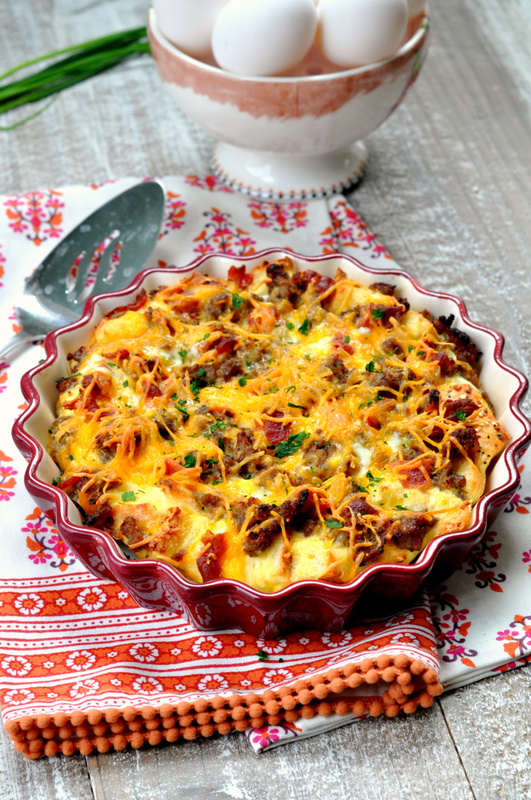 For my version of a meat lover’s breakfast casserole, I use breakfast sausage, diced ham and chopped bacon. You could totally change it up and choose your favorite meats. For the bread, I love using the everything French bread from our local store. If you can’t find that, you can use a cubed French or Italian bread instead and just add 1 Tbsp of everything seasoning to it. I always assemble my casserole the night before and then take it out of the refrigerator while the oven preheats. That way, it is ready to bake as soon as the oven is ready. 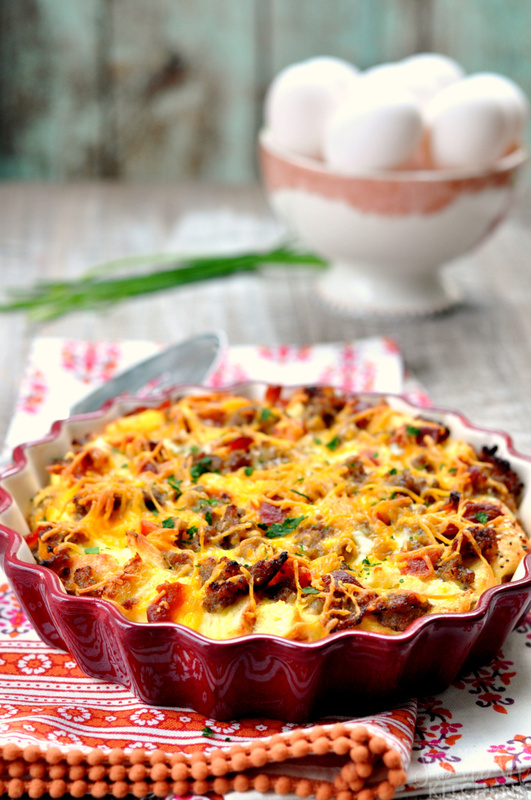 If you make this meat lover’s breakfast casserole or any other recipe from the blog, I’d love to hear about your experience. Let me know if the comments or snap a photo and tag it #MySuburbanKitchen on Instagram or Twitter. 1. Lightly grease a 9x13 casserole dish. 2. In a large bowl, whisk eggs. Add salt and milk. Whisk until fully combined. 3. Stir in bread cubes, sausage, bacon, ham and 1 cup shredded cheddar cheese. Pour into prepared casserole dish. Refrigerate overnight. 4. Remove casserole from refrigerator and top with remaining 1 cup of shredded cheddar cheese. Cover with foil. 5. Preheat oven to 350 degrees. Bake casserole for 50 minutes. Remove foil and cook for an additional 10-15 minutes or until cooked through.